“Breathtakingly beautiful” and “hauntingly apocalyptic” – that’s how the work of world-renowned landscape photographer and documentarian Edward Burtynsky has been described. At a special Crescent School presentation on March 28, 2019, he enthralled Upper School students with his art and his environmental message. Burtynsky has devoted his career to documenting how humanity as a species has altered the landscape of our planet. His epic images of recycling yards, mine tailings, quarries and refineries around the world bring home how industry has transformed nature. During the question-and-answer session at the presentation, a student asked Burtynsky “what can we do?” in the face of planetary devastation. “It’s a daunting question,” Burtynsky said, because “Canada is a small country relative to the billions of people on this planet.” He said there are ways that Canadians can bring about change. The first is through “personal behaviour” and making choices about the foods we eat or the carbon footprint we leave. He said the second way is “through your wallet” by supporting industries and products that are kinder to the environment, such as electronic cars. Lastly, he said, you can make change by “how you vote” and supporting government with strong environmental policies and regulations. 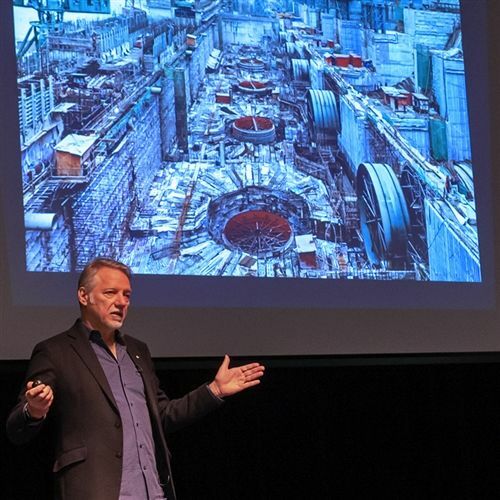 Burtynsky’s presentation was made possible by the John Tansey Endowment Fund at Crescent. It was the first in a series of events that Crescent is holding to commemorate Earth Month. One of these will be a presentation by Nicholas De Pencier and Jennifer Baichwal, the filmmakers who collaborated with Burtynsky to create their award-winning film trilogy: Manufactured Landscapes, Watermark and Anthropocene: The Human Epoch.